Last weekend I attended the North American Conference of the Barbara Pym Society. 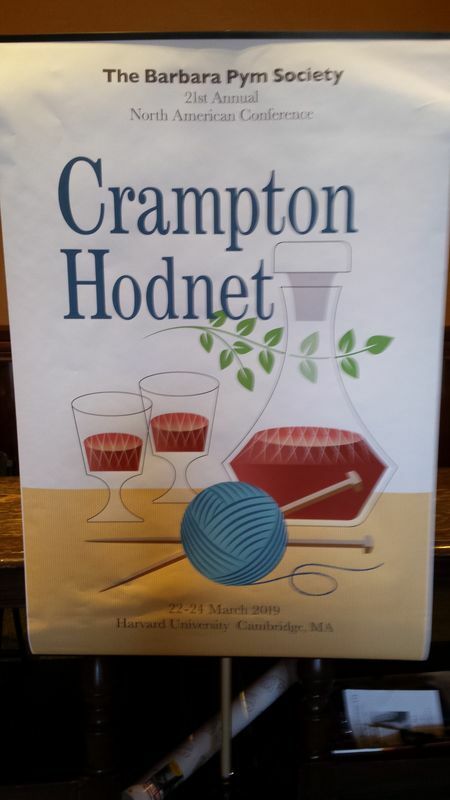 It was a wonderful opportunity to discuss the work of my favorite novelist, hear presentations about the novel "Crampton Hodnet", which was the topic of this year's conference, and also to have plenty of time to knit in public! In addition to being a writer, Barbara Pym was also a knitter, and there are many knitting references in her books -- as you can see on the conference poster. So, knitting in the audience is actually encouraged. Here I am, knitting a top down cardigan (same pattern as the one I'm wearing in the photo, which is a 1960's pattern). Lovely! I love Barbara Pym. I found out about her maybe 20 years ago by reading a list of writers' writers. She popped up on everyone's list, so of course, I had to go out and get her books. When you open the pdf provided, there are 4 patterns, this is the last one, "The Yarn Over Open Raglan". Please give us more details. You are so pretty and a wonderful knitter. Pym Lives! Hi, SQM, and thank you! This is the website for the Barbara Pym Society, where there is lots of detailed information about Pym's life, the books, and the conferences. 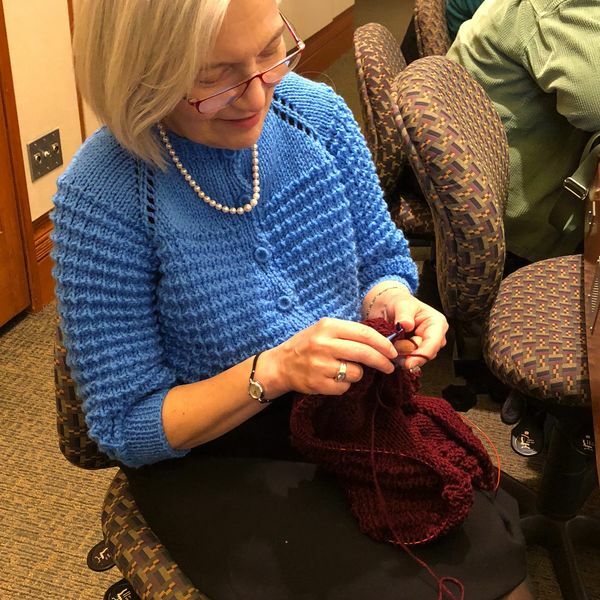 This year, 119 people registered, most from the U.S., several from England and Wales, one from Austria, and with varied backgrounds and ages, and several knitters! Thanks for the info. Were any men there? Yes, about 20 men attended, and some of them are active in the organization, including the North American Coordinator of the BP Society. Thank you for an author recommendation. Only one of her books is an audio in the library so far. I love to listen & knit. This sweater looks beautiful on you. What sizes does it come in. I looked at the pattern and didn't see only one size. The size information for all 4 sweaters in this set of patterns is on the first page, they just use different size needles for making different sizes. I know what you mean, I like audio books for knitting, and have only been able to get one, "Excellent Women." It's a really good one, usually recommended when people ask which one to read first. Love Barbara Pym. I've read all her books twice and may give them another go. Thanks for the link to your sweater. You look lovely in it.